As a young woman starting out on my journey to adulthood, I’ve slowly come to the realization that it is a lot harder than anyone ever told me. Case in point: my finances. Growing up we are hardly taught in school how to be financially responsible, so unless you are lucky enough to have parents that would discuss finances, most of us are left to figure it out on our own. This is especially hard for women as the traditional role in the household has not been one responsible for financial decisions. Savings and investments are an important part of building a financial safeguard. Having a mix of savings (RSPs, TFSA, long-term, short-term and emergency funds) and investments (mutual funds, GICs, stocks, etc. ), are key to becoming financially secure, but having all these accounts can leave you feeling overwhelmed and intimidated. To combat this, our financial advisors suggest setting up automatic transfers to your savings and investment accounts. At first it might seem scary having money automatically come out of your account, but after a while you adjust and learn to live within what’s left. Remember it’s not about how much you make, but how much you spend. For many of us, finances is a stressful topic, especially when we deal with it on our own. Luckily, there are people out there to support you. Financial Planners/Advisors are a great resource for helping you derive a plan for your future by looking at the big picture. The key is finding one that reflects your comfort level. If you are a conservative investor, a Financial Planner that is more aggressive isn’t for you, and vise-versa. Money and finances are already anxiety-provoking topics so finding someone that you are comfortable with is key to creating a financial plan suited for you and your needs. When looking for a Financial Planner, don’t be afraid to shop around and even interview them, they are there to provide a service that you are paying for, so don’t settle for the first one you meet. Like many others my age, I didn’t really think I needed insurance because I don’t have any dependents or assets that may be at risk if something were to happen to me. But the truth is you do, and it’s actually better to get it at a younger age. Not only are you more likely to pay lower premiums (because you are young and healthy), but it also helps when you are ready to buy a house and it will help your family with any remaining costs/debts (i.e. funeral costs, remaining student debt, co-signers on your mortgage, etc.). As one of our facilitators Darlene put it “the biggest detractor to success in financial health is mindset”. With that said, it’s important that as young women we take the time to think about our relationship with money and address our unhealthy habits/attitudes. Whether you grew up with parents who were tight with their money, or ones that bought any and everything, we all hold certain ideologies towards our finances. Deciphering those attitudes is as much a part of financial planning as budgeting and saving; no matter how good your financial plan is, it is useless if we can’t follow through with it. Do you really need that new pair of shoes? Can you wait a couple more months for that vacation? Changing your relationship with money changes your priorities. Leaving the workshop, I felt empowered and excited about conquering my financials. For me, the biggest take away from the workshop was realizing that it’s okay to not know everything, because there are people out there to help. There is an abundance of information available to you - all you must do is ask. 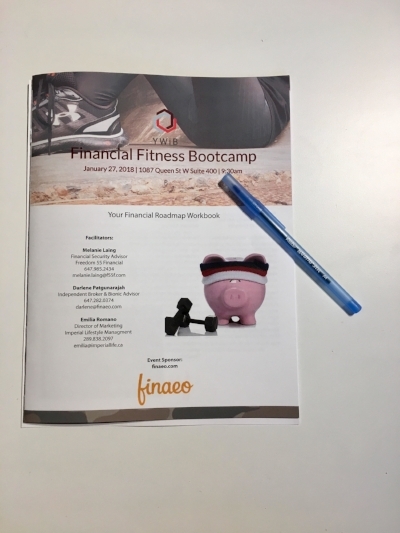 Taking on the challenge that is financial planning becomes a lot easier when you start asking questions because once you start you’ll never stop.